Eugene's Jace Peterson picked a good time -- the start of postseason play -- to break out. The Padres' first-round draftee fell a single shy of the cycle and scored a career-high four runs Monday as his Emeralds topped the host Vancouver Canadians, 8-3, in Game 1 of the Northwest League West Division best-of-3 first-round series. "We needed to get this first win on the road, and this gives us a lot of confidence for us going back," Peterson said. "We definitely like to have two games at home with a packed crowd in Eugene." 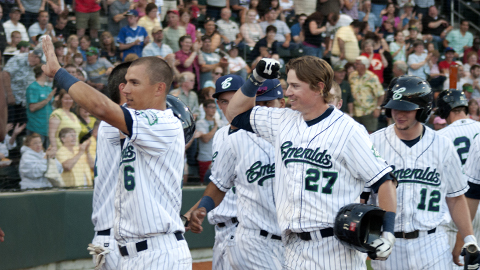 The Emeralds (46-30) won both the first- and second-half West Division titles, finishing ahead of the second-place Canadians (39-37). Vancouver entered the game with five losses in its past six games. Peterson led off the game with the third homer of his career. "I got a ball up and was on time and I put a good swing on it," he said. "I wasn't trying to homer. When it does go out, it's an accident -- always." Teammate Lee Orr smacked a second-inning solo shot. "Any time he gets a hit, especially a home run, I am the first one up and out of the dugout," Peterson said of Orr, who also singled and walked in five plate appearances. "He's one of my best friends, and I am proud that we were able to do it together." But the 21-year-old out of McNeese State performed a solo act the rest of the way. He walked and scored in the third, doubled and scored in the fifth, lifted an RBI sacrifice fly in the sixth and tripled and scored on a wild pitch in the ninth. The Emeralds charged their first four runs to starter Blake McFarland (0-1), who walked four and struck out three. Peterson, the 58th overall pick in the June Draft, batted .243 with two dingers (struck on back-to-back days on Aug. 23 and 24) in 73 regular season games. Just once, on July 5, he recorded three hits in a 9-3 victory over Vancouver. He doubled in a run and singled in his first three at-bats that day, opposing McFarland. "I have been feeling good for the last three weeks, but it is all starting to come together," Peterson said. "I have been hitting the ball hard just right at people. Hopefully, that's behind me and the ball can keep finding holes like it did today." Eugene starter Cody Hebner, a fourth-round draftee in June, gave up Nicholas Baligod's first-inning homer. In his eighth straight turn in Eugene's rotation, the 20-year-old right-hander retired 13 of the final 14 batters he faced, pitching around a walk to Matt Newman. Hebner (1-0) allowed one run on two hits and struck out six while matching a career high in five innings of work. He retired seven on the ground. Games 2 and 3 will take place in Eugene on Tuesday and Wednesday.